I obtained this figure in August, 1904, from Dr. Haddon, who learned it from a native of Lifu, Loyalty Islands, who happened to be residing in Mabuiag in Torres Straits. (See Rivers and Haddon, p. 149, Fig. 2.) In Lifu it is known as Tim, = a Well. It is precisely similar to the Torres Straits figure which in Murray Island, is called Ti Meta, = the Nest of the Ti bird, and in Mabuiag, Gul = a Canoe. 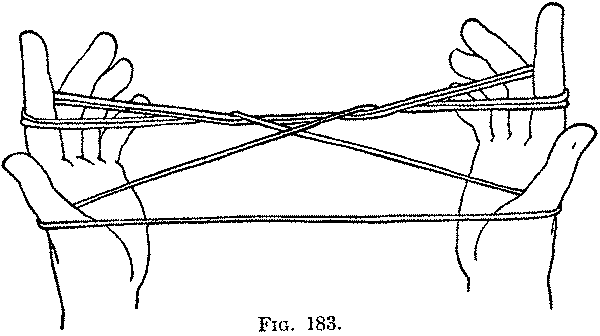 Second: Keeping the hands well separated, with the strings quite tight, and turning the palms slightly away from you, pass each index away from you over the far index string and the near little finger string and then well down into the little finger loop. Now, turning the palms gradually toward you, bend each index carrying these two strings toward you (with the tips pointed toward each palm), and then up between the near index string and the thumb (which must be kept upright), but not touching the thumb loop (Fig. 181). This movement brings the far index string and the near little finger string up toward you while the near index string slips away from you over the knuckle of the index and entirely off that finger. Now turn each index completely up, and straighten it (Fig. 182), when it will be seen that the original far index string and the near little finger string have both become far index strings. Release the strings passing around each little finger. You now have two loops on each index, twisted toward the centre of the figure; and a loop on each thumb (Fig. 183). 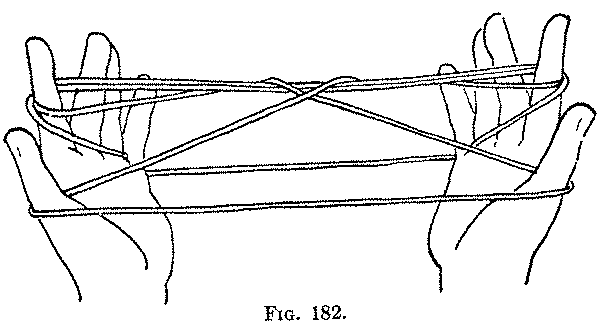 Third: Turning the palms toward you, with the middle, ring and little fingers of each hand pull straight down, as far as possible, the two far index strings (Fig. 184). 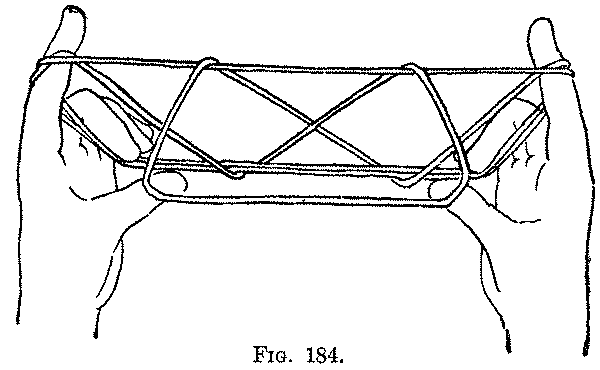 Fourth: Gently withdraw each thumb (Fig. 185, Right hand). Fifth: Bend each thumb away from you into the former thumb loop (now hanging from the top straight string of the figure), and pick up, with the back of the thumb, the diagonal string passing from the near side of the index down around the two strings at the bottom of the figure (Fig. 185, Left hand), and pull it toward you through the hanging loop. Raise the thumbs toward you and the index fingers away from you, and keep the lower strings well down, by bending the middle, ring and little fingers around them, and the finished figure will appear (Fig. 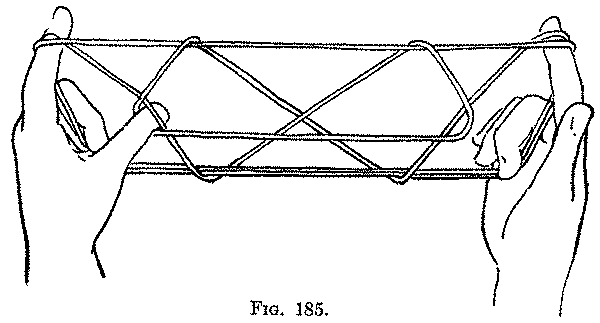 186). The well is said to be "full of water" when the inverted pyramid of the figure is made high, and to be "dry" when the base and apex of the pyramid are brought to the same level, by letting the lower strings, held down by the fingers, come up to the same plane as the other strings. The Second movement is a new one; its purpose is to put the little finger loop on the index, above the original index loop, and turn it over in the transfer. The original index loop gets, of course, a twist in the process. The Fifth movement is the only practicable method of drawing the index string through the thumb loop from above.